Zack Danziger has been playing music since childhood. His early influences include classical, jazz, rock, pop, blues, and hymns. He earned his Masters Degree in Jazz Performance at City University of New York, Queens College. He taught public school music for 18 years. He has performed and/or recorded with such notables as Heather French (Miss America), Charles Neville, Samirah Evans, Jeff Holmes, Karrin Allyson, Joel Martin, Miro Sprague, Paul Lieberman, Annie Patterson, Mary Witt, and Katelyn Richards, among others. He performs regularly with many bands including: Tin Pan Valley, Dixieland Stomp, Jazz Bones, Phun Stuph, and more. 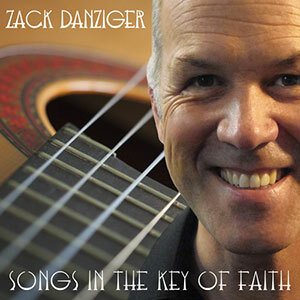 Zack just released his new CD “Songs in the Key of Faith,” a collection of 12 hymns arranged for solo and multiple guitars. With his study of jazz and classical guitar, as well as composition and arranging, he lets the hymns lead him on musical journeys that are fresh and original, and then brings us back home again to restful resolution. I really love the Inspirational Song of the Week. Thanks for putting this together and sharing. This week’s is wonderful as always. I wish everyone in Paris could hear this beautiful piece of music played by Zack. It is a soothing, but strong statement of PEACE.